Range: Found throughout North America. 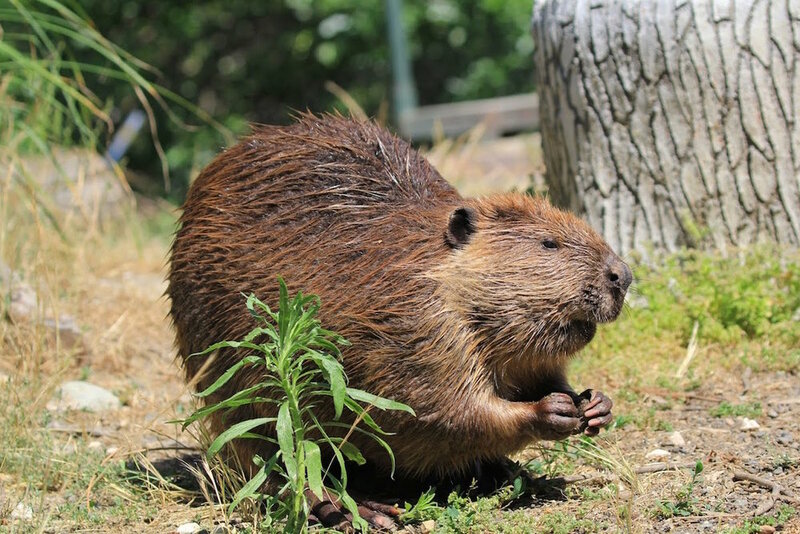 Habitat: Beavers are semi-aquatic mammals who live on the banks of rivers, streams, and ponds. Diet: They are herbivores and prefer to eat leaves, bark, twigs, roots, and aquatic plants. Beavers are nocturnal, so most foraging is done between dusk and dawn. Lifespan: 10-15 years in captivity. Timber was born at the Minnesota Zoo on June 23, 2014. He came to Turtle Bay on August 13, 2014 at only seven weeks of age. Largest rodent in North America. North American beavers usually weigh between 40-60 pounds. Beavers tend to be social, living in a colony of up to eight; however, it is not uncommon for males to remain bachelors their entire lives. Because beavers prefer deeper pools they will often make less desirable habitats into ideal ones by damming streams, creating deep ponds and lakes. Not only do they construct dams, but they build lodges to live in as well. They store branches and twigs underwater to sustain them throughout the winter. Beavers have castor glands near the base of their tail that they use to mark their territory as well as help waterproof their fur, hence their genus name: castor! DANGER! A loud, resounding slap of their tail on the water warns all beavers in the area that danger is near. They can swim 5 mph. Beavers can hold their breath up to 15 minutes under water. They have ever-growing, chisel-like front teeth (like all rodents). Beavers store iron in their teeth, adding strength and giving them an orange color. Front feet have five fingers that are skilled at manipulating objects. Not all beavers make dams, only ones who need to alter the environment.